Laurier, Wilfrid. "Wilfrid Laurier: Speech in Defence of Louis Riel, 1874 ". The Canadian Encyclopedia, 14 July 2017, Historica Canada. https://www.thecanadianencyclopedia.ca/en/article/wilfrid-laurier-speech-in-defence-of-louis-riel-1874. Accessed 18 April 2019. The 1869 Métis uprising in Red River had deeply divided Canadians along religious and linguistic lines. Five years later, the election of Louis Riel as a member of Parliament (MP) prompted a debate about whether the House of Commons should allow Riel to take up his seat there. 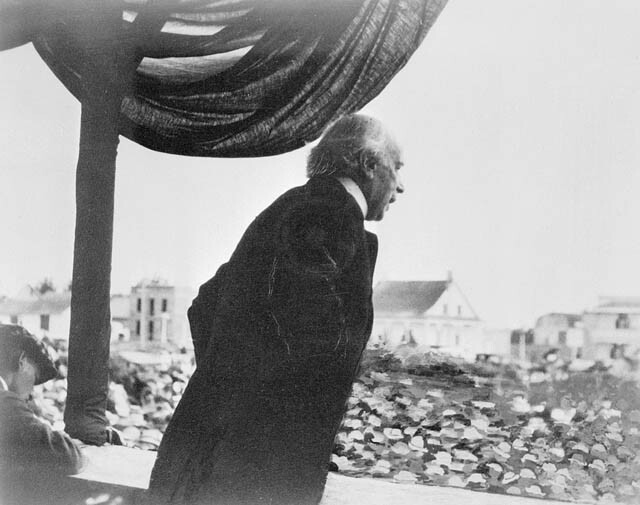 Wilfrid Laurier — by this time a federal MP in the new Liberal government of Alexander Mackenzie — stood firmly on Riel’s side. Laurier had little personal sympathy for Riel. Politically, however, he used Riel and the Métis cause as a way of staking out the moderation and pragmatism that would become a hallmark his career. On 15 April 1874, he issued this stirring defence of Riel in the House of Commons. 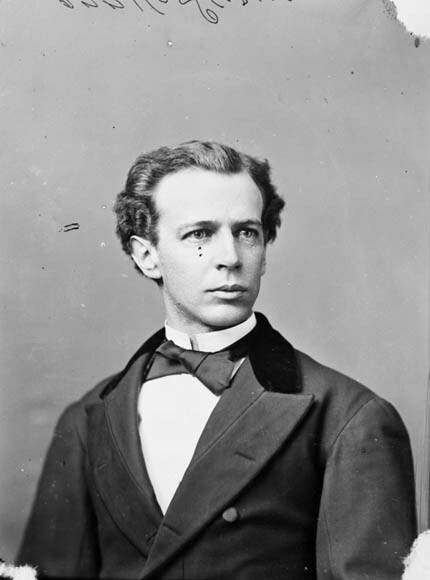 Wilfrid Laurier, MP (Drummond-Arthabaska), February 1875. Mr. Speaker: Although this debate has been prolonged beyond the limits of human patience, I shall nevertheless take the liberty of putting the indulgence of the House to the test. At first, it was not my intention to take part in this discussion, but it has taken such an unexpected turn that it seems to me that I would not properly do my duty towards myself and towards my constituents if I contented myself with giving a silent vote. "It has also been said that Mr. Riel was only a rebel. How was it possible to use such language? What act of rebellion did he commit? Did he ever raise any other standard than the national flag? Did he ever proclaim any other authority than the sovereign authority of the Queen? No, never. His whole crime and the crime of his friends was that they wanted to be treated like British subjects and not to be bartered away like common cattle? If that be an act of rebellion, where is the one amongst us, who, if he had happened to have been with them, would not have been rebels as they were?" I have listened, Sir, with the greatest attention to all the arguments which have been advanced in support of the main motion, and, although some of these arguments have been urged by men whose opinion I greatly respect, I must frankly admit that I have found it impossible to be convinced by them; I have not been con­vinced that, at the point reached by the proceedings taken against the Member for Provencher [Louis Riel] and with all that has been proved thus far against him, we would be justified or have the right to expel him. The conclusion to which, in my opinion, the House should come is that there have been too many facts raked out of oblivion and laid to the charge of the Member for Provencher to permit of his being absolved; it is not the less true that too many other facts have been overlooked to warrant his expulsion. . . . But, before going further, I must apologize to the House for using a language with which I am only imperfectly acquainted; really, I should claim a complete amnesty, because I know only too surely that, in the course of the few remarks I wish to make, I shall frequently murder the Queen’s English. I am perfectly conscious of the disagreeable task which I impose on the House when I force it to listen to a man so unfamiliar with the language he uses, but I can assure you that if it is a task for the House, it is much more disagreeable for myself. I am so convinced, so thoroughly convinced, that the adoption of the Honourable Member for Chateauguay’s amendment is the only course that the House should pursue that I consider that I would be guilty of an act of cowardice if, for any motive whatever, I allowed myself to be turned away from the defence of the opinions which I regard as the soundest and safest on this subject. As I have already stated, I would not have had the presumption to take part in this debate, but I think that I am warranted in intervening, because it seems that the true question before the House has not been treated. Many secondary considerations have been raised, but the real question has not been touched. The question has been treated as if the facts on which the main motion is based had been proven and proven beyond all doubt. Now, I maintain that the facts alleged in the motion have not been estab­lished in a way to warrant this House in voting the expulsion. I desire to state at once that I have no side taken on the question now before us against the Member for Provencher, I have not the slightest prevention and, on the other hand, I have no predisposition whatever in his favour. I have never spoken to him; I have never seen him; I have never had any relations with him either directly or indirectly. He belongs to no political party and between him and me there is no bond of sympathy; I am as impartial as if I was in the jury box. And we should all act as if we were jurors, because the functions we exercise at this moment are judicial functions. It is quite true that the object in view is to protect the honour and purity of this House; but it is equally true that the effect might be to deprive one of our fellow citizens of what rightfully belongs to him, to strip the Member for Provencher of his title and privileges as a Member of this House, and to rob the county of Provencher of the services of the man whom it has chosen as its representative. That he disobeyed the order of this House, commanding him to appear in his seat on the day fixed. I contest the Honourable Member for North Hastings’s first assertion and I maintain that there is not a shadow of proof that an indictment was laid against the Member for Provencher and that a true bill was returned against him; I mean to say that there does not exist the slightest judicial proof which would justify this House in taking action. There was only one way to prove this precise fact: it was by producing the indictment, but nothing of the sort has been done. QUESTION: Did an indictment of Louis Riel take place before the Court of Queen’s Bench, in Manitoba? ANSWER: At the extra term of the Court of Queen’s Bench for Manitoba, in November last, Louis Riel was indicted. And that’s all. There is not a word to indicate that a true bill was returned. If I make this remark, it is not because I attach any great importance to this omission, for, from my point of view, the indictment could not be proven except by the production of the document itself or of a certified copy of it. I have made this remark for the sole purpose of showing how weak is the proof, even from the most favourable point of view as regards the motion. But it will be said, perhaps, that we have ample proof that a true bill was returned, in the warrant which was issued against Mr. Riel and which has been produced. This argument cannot be accepted. I will remind the House once more that we are exercising judi­cial functions and that we should be guided entirely by the rules of judicial proof. Is the rule admitted by Lord Granville when the question was to deprive a man of his property not just enough that we should obscure it in the present case? Wherefore I again insist on the necessity, the absolute necessity, of deciding this question according to the rules of judicial proof and not otherwise. The first of these rules is that, when the best proof can be fur­nished, secondary evidence is never admitted. Now, I note that this principle, which I have just laid down, has been admitted and rec­ognized by the Honourable Member for North Hastings himself. In fact why did he bring the Attorney General of Manitoba to the bar of the House? Simply, to get official judicial proof regarding the charges which he has made against the Member for Provencher. It was not to bring any new facts to the knowledge of the Members of this House. We are acquainted with all the unfortunate events that have occurred in Manitoba before and since the entry of that province into the Confederation. Every one of us knows these facts as well as the Attorney General of Manitoba himself and when he appeared at the bar, not a single Member learned a fact that he had not previously known. Why then did the Honourable Member for North Hastings bring here the Attorney General of Manitoba and get him to repeat what we already knew as well as the witness? It was because he admitted and recognized the principle which I am defending at this moment. It was because he recognized the fact that the complete knowledge which each of us possessed was not sufficient to permit the House of Commons to act; because he recognized that we are exercising judicial functions and that it was essential for him to establish judicially and by the best evidence the charges he has made against the Member for Provencher. Since he admits this principle, he should be consistent and furnish literal proof of his charges; but in this he has completely failed. He was bound to produce an indictment, but he has failed in this duty and I can safely conclude that there is no proof that the Member for Provencher was indicted and that a true bill was found against him. It will be argued, perhaps, that the reasons which I advance are pure legal subtleties. Name them as you please, technical expressions, legal subtleties, it matters little; for my part, I say that these technical reasons, these legal subtleties, are the guarantees of British liberty. Thanks to these technical expressions, these legal subtleties, no person on British soil can be arbitrarily deprived of what belongs to him. There was a time when the procedure was much simpler than it is today, when the will alone of one man was sufficient to deprive another man of his liberty, his property, his honour and all that makes life dear. But, since the days of the Great Charter [Magna Carta] never has it been possible on British soil to rob a man of his liberty, his property or his honour except under the safeguard of what has been termed in this debate technical expressions and legal subtleties. It will be further objected, perhaps, that the admission of this principle will have the effect of preventing this House from reach­ing a man accused of an abominable crime. This objection simply evades the question, for the point which remains to be decided is whether it is true that such a charge exists against the Member for Provencher. I maintain that, as long as we have not before us the literal proof, we have no proof. It is perfectly true that in matters of this kind, we exercise a sovereign authority. No power can alter what we shall do, no matter how unjust or arbitrary it may be. We can, if we like, take no account of the precedents cited for our guidance, pay no attention to the sacred laws established for the protection of the citizen, act upon incomplete evidence or upon none at all, but will we do so? We undoubtedly have the power, but have we the right to arbi­trarily set aside the rules which constitute the security of society and of the citizen? If the House forgets this today, it may perhaps, obtain a temporary satisfaction, but it will create a precedent which will be a perpetual danger for our constitution and which in the future will serve as a pretext for more crying acts of injustice. I submit to the consideration of the House that he who has to apply the law should not try to show himself wiser than the law. I submit that there is no practice more dangerous than to try to vio­late the law to obtain any result, no matter how desirable it may be. I will be further told, perhaps, that these are lawyers’ objections. This remark may have some force, but what is still more forcible is that these objections command the respect of every man who respects the laws of his country. I repeat that these objections are not mere subtleties. While we have not the indictment here before us, we have only an incomplete proof, a part of the proof. If we had had the indictment, we might have questioned the Attorney General and then we would have succeeded in bringing out an important fact, namely, that that indictment was obtained by a conspiracy between the Attorney General and a packed jury. In any case, we could have cross-questioned the Attorney General in regard to his strange conduct. We would have learned how it was that he, with zeal enough to turn simple constable with a bench warrant in his pocket, did not seek before today to capture the man whom he calls a murderer; how it was that to that man, whom he now calls a murderer, he for years applied the title of friend. Now, we cannot cross-question the witness on these important points, while we have not before us the proof of the principal fact, which would have opened the door to important developments. Mr. Speaker, nobody has forgotten that the Honourable Member for North Hastings, in making his motion, laid stress chiefly on the precedent furnished by the English House of Commons in the Sadleir case. That precedent, I accept not only on this, but on all the other points, and I will call the attention of the Honourable Member to one thing, which was that the first step taken against Sadleir was to prove the indictment found against him, by laying on the table an authentic copy of the same. I now pass to the second allegation of the motion of the Honourable Member for North Hastings, which states that the Member for Provencher has systematically eluded the pursuit of justice and that he is at present guilty of contempt. If there is no proof before the House of an indictment against the Member for Provencher, it is impossible, legally speaking, to pretend that he is a fugitive from justice and this, of itself, is enough to destroy the assertion of the Member for North Hastings. Without, however, adopting this, perhaps, extreme way of looking at it, let us face and examine the question squarely: is the Member for Provencher a fugitive from justice or is he not? Is he or is he not contumacious? I have already repeated that we have no legal proof of an indict­ment; it is true that we have before us that a bench warrant was issued by the Court of Queen’s Bench in Manitoba against the Member for Provencher and that so far that warrant has not been executed. This is all the proof before this House in support of the motion of the Honourable Member for North Hastings. Well, I do not hesitate to say that, in law as well as in justice and equity, it cannot be concluded from this simple fact that the Member for Provencher can at this present hour be considered as contumacious. In point of fact, that warrant was issued at the term of November last. Now there is nothing very extraordinary in the fact that it could not be executed in time to bring the accused before the court before the close of the term; the Member for Provencher might have been absent from Manitoba at that period. It is notori­ous that, since the unfortunate events of 1869–70, he has almost constantly resided abroad.39 It is very possible that the news of his indictment may not have reached him until after the close of the term. But, it may be said, why did he not give himself up then? Simply because it was better for him to remain at liberty until the next term. If he had given himself up at once, he would have been obliged to remain a prisoner for six or seven months, perhaps, awaiting his trial. Who can say, however, that he will not appear even tomorrow before the court, if it required his presence tomorrow? Who can say that he will not eagerly seize the occasion to stand his trial if that occasion be given him? But I hear it said: there was quite recently a term of the court and he did not give himself up to answer to the charge standing against him. Sir, this object is worthless, because if you pretend that the court has sat, then where are the proceedings which have been taken to establish that he is a fugitive from justice? Where is the report of the sheriff of the province attesting that he tried to execute the warrant issued against the Member for Provencher, but that he could not succeed in doing so? In the face of this proof or rather of this absence of proof, where is the English subject, with respect for English law, who will dare to rise in this House and maintain that the Member for Provencher is contumacious? But there is more than all this. The Member for Provencher has always asserted that the old Administration had promised him an amnesty for all the acts in which he had taken part in Manitoba prior to the admission of that province into the Confederation. He has reiterated this assertion twenty times, perhaps. His friends have made the same assertion and the old Administration has never been willing to speak out on the subject. Called upon over and over again to declare what there was in this alleged promise of amnesty, to state simply yes or no, it has never been willing to say yes or no. I regard this obstinate silence of the old Administration as an absolute confirmation of the pretension of Mr. Riel and his friends – it is a case of silence giving consent. Well, if this be the case, if the Member for Provencher was promised an amnesty for all the acts which he may have committed in Manitoba while at the head of the provisional Government, is it surprising that he should not want to submit to those who now wish to drag him before the courts for those same acts? Is he not war­ranted in so acting? Is he not right in so doing in order that the promise of amnesty made to him, in the Queen’s name, may be carried out? Who can say that, under the circumstances, he is a fugitive from justice, that he is contumacious? No, Sir, as long as this question of the amnesty has not been cleared up I, for one, shall never declare that this man is a fugitive from his country’s justice. Moreover, this question will be soon elucidated, as no later than last week we named a committee to enquire into it. This committee is sitting at this moment and the House, in my opinion, would do not only a culpable, but an illogical and inconsistent act, if it came to any decision affecting this question from near or far, until it has received the report of the committee. In addition, Sir, from the legal point of view alone, at the stage reached by the proceedings taken against the Member for Provencher before the Court of Queen’s Bench, in Manitoba, it is impossible to say that he is contumacious. I have already stated that I was ready, in all respects, to follow the rules laid down by the House of Commons in the Sadleir affair: now, the principal rule adopted in that affair is that a man cannot be declared guilty of contempt unless all the opportunities of stand­ing his trial have been exhausted and that he has not sought to take advantage of them. When the Sadleir affair came up for the first time before the House of Commons the motion for expulsion was rejected, because Sadleir could still come before the court to stand his trial and because it would have been premature to declare him contumacious. The House of Commons adopted this wise suggestion and, as I have already had the honour to state, the motion of expulsion was rejected on that occasion. There, Sir, is an example already traced out for us: for my part, as I have already remarked, I am ready to follow it in all respects. I do not know whether the Honourable Member for North Hastings is prepared to say as much. I come now to the third point of the motion; that the Honourable Member for Provencher has disobeyed the order of this House commanding him to appear in his seat on a fixed day. I maintain that this fact does not exist. The Member for Provencher could not disobey, for the simple reason that he could not have regularly had knowledge of this order, since it was never signified to him. I now expect to hear the Honourable Member for North Hastings tell us that it was useless to try to serve the order of the House on the Member for Provencher, since nobody knows where he is at this moment. But, if it was impossible to serve the order personally on the Member for Provencher, it was easy to have served it at his domicile, as in the Sadleir affair. Is there not an absolute similarity between the two cases? And look at the minute precautions taken by the English House of Commons to notify Sadleir and to call upon him to defend himself against the motion of expulsion! Here, nothing of the same kind has been done, absolutely nothing. I therefore contend and I defy contradiction on this point that the House cannot take into consideration the motion of the Honourable Member for North Hastings as long as it has not served on the Member for Provencher the order commanding him to appear in his seat, as long as it has not challenged him to defend himself. For it is the privilege, the right, in fact, of every British subject that he shall be stripped of nothing which belongs to him, without first being called upon to defend himself. But it will be said, perhaps, on the other side of the House: What is the good of all these purely abstract objections? What pur­pose would it serve to notify the Member for Provencher of the motion to be made against him? Are not all the facts charged against him true? Is he not guilty? Even though he were the greatest culprit in the world, the law should be followed and respected. Even though he might not have a word to say in his own defence, he should not the less be notified. The fundamental principle of all justice is that nobody shall ever be condemned, without having been heard in his own defence, or without having been called upon to defend himself. In numerous cases decisions, just in themselves and perfectly equitable, have been reversed by the higher courts in England, solely because the party condemned had not been notified to defend himself. As for me, Sir, I am of French origin and my education has been French, but I have this of the Briton in me: an ardent love of fair play and of justice. Now, I assert and nobody can contradict me that the Member for Provencher has not on this occasion had either jus­tice or fair play. The House is asked to come to an unjust and illegal decision; but, for my part, I shall never consent, in this instance or any other, to deprive a man of the smallest particle of his rights or property without first having given him the benefit of all the legal forms to defend himself. I therefore believe that, on this point as on the preceding ones, I can conclude in all safety that the allegations on which rests the motion of the Honourable Member for North Hastings are not sup­ported by sufficient proof. These reasons are certainly conclusive in favour of the amend­ment of the Member for Chateauguay. To that amendment, my Honourable Friend, the Member for Bagot [Joseph-Alfred Mousseau] has proposed a sub-amendment, demanding purely and simply an amnesty on the spot, without waiting for the report of the commit­tee of enquiry. It is difficult to conceive a reason to warrant this demand of the Honourable Member. A member on the ministerial side told the Honourable Member for North Hastings yesterday that his object in making his motion was much less to expel Mr. Riel than to try to embarrass the Government. I suspect that the object of the Honourable Member for Bagot, in proposing his amendment, is absolutely the same. There seems to be an intimate alliance between the Honourable Member for North Hastings and the Honourable Member for Bagot, (extremes meet:) both are on the war path and both are assailing a common enemy; one directs his attack against the right flank and the other against the left, and both hope that, if the enemy escapes from the blows of the one, he will fall under those of the other and that they will succeed in each planting his flag on the fortress top. Sir, I have not the honour to know the Honourable Member for North Hastings, and I would not wish to suspect his motives; I do not . . . . . . .
Mr. Bowell: Oh! Don’t hesitate: I have no scruples. Mr. Laurier: But I have. Once more, I say, I have not the advan­tage of knowing the Honourable Member for North Hastings. I do not want to suspect his motives; I would rather believe in their sincerity. But as for my honourable friend, the Member for Bagot, I know him too long and too well to not read his game clearly and I do not hesitate to say that he is far less anxious for the amnestying of Mr. Riel than he is for compromising the administration, if pos­sible. I think that when the Honourable Member for Provencher learns what is happening here today he will exclaim: Lord save me from my friends! As a matter of fact, could the Honourable Member for Bagot seriously hope that the House would adopt his amendment? Why then did he propose it? It was only last week that the House unani­mously named a committee to enquire into the whole question of the amnesty, and, at this very hour, this committee is sitting and Mgr Taché is giving his evidence before it. Now, Sir, this committee is useful or it is not. If it has no util­ity whatever, why did not the Honourable Member oppose it when it was asked for? Why did he not propose a sub-amendment, recommending the immediate granting of the amnesty? Why did he not save to the country the enormous expense that the enquiry will entail? If, on the other hand, the enquiry made by the committee may be useful for the amnesty, why not wait until Mgr Taché and Father Ritchot have given their evidence? Does the Honourable Member for Bagot imagine that he is doing a service to Mr. Riel in striving to deprive him of the benefit of the evidence of Mgr Taché and Father Ritchot? Does the Member for Bagot think that the evi­dence of Mgr Taché and Father Ritchot will have less effect towards obtaining the amnesty than his sub-amendment? Well, if all that has been said about the promises made by the ex-Government to Mr. Riel be true, I am in favour of the amnesty, and for this reason I shall not hesitate for an instant about voting against this sub-amendment. And, if my honourable friend will permit me, I will tell him that his sub-amendment will not have in the province of Quebec the effect he anticipates from it. Because, Sir, I tell the Honourable Member that from this day forward the province of Quebec will know who are the pretended friends of Mr. Riel and what they are aiming at in shouting so loudly in his behalf. I also trust that Mr. Riel will understand that he has been made the tool of a few intriguers, who, in the name of friends, have endeavoured to make him the instrument of their machinations; in time, I trust that he will understand that his best friends are not those who most pretend to be such. Yea, I am in favour of the amnesty, and when the time comes, that is to say, when the committee has made its report, when the proof which has been begun has been closed, I will not be the last to demand it. 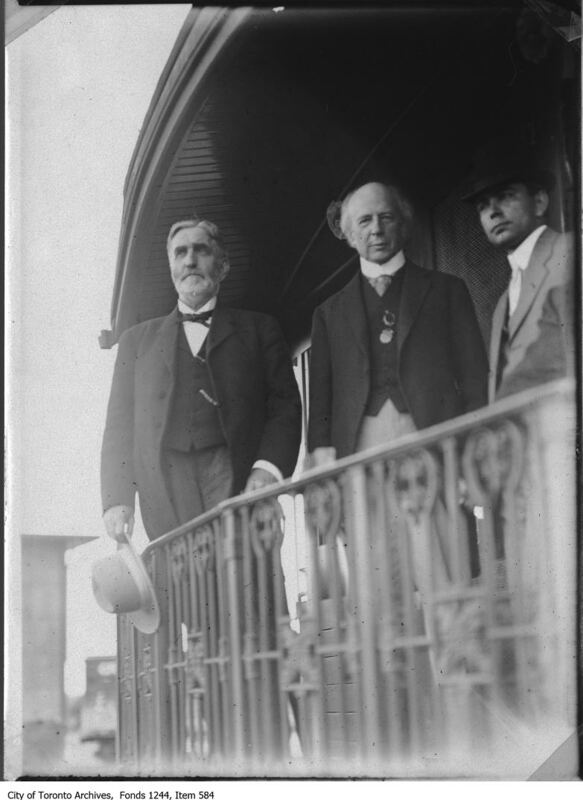 I am in favour of the amnesty for two reasons: the first is that given, last night, by the Honourable Member for South Ontario [Malcolm Cameron], that the Canadian Government received the delegates of Mr. Riel’s government and treated them him as one power treats with another power. If this reason exists in fact, the conclusion is inevitable: the amnesty must be granted. Yesterday, the Honourable Member for South Bruce, (Mr. Edward Blake), replying to the Member for South Ontario, seems to have admitted the legality of the proposi­tion emitted by the latter, because he gave for sole answer that the proposition did not exist as a question of fact, that Mr. Riel’s dele­gates had ever been received by the Canadian Government as del­egates of Mr. Riel, but as delegates of the people of Red River. Certainly, I would think it an honour under almost all circum­stances to adopt the Honourable Member for South Bruce’s way of thinking, but I cannot do so in this instance the proof he offered us in support of his opinion being anything but conclusive to my mind. In fact, what proof did he give us? 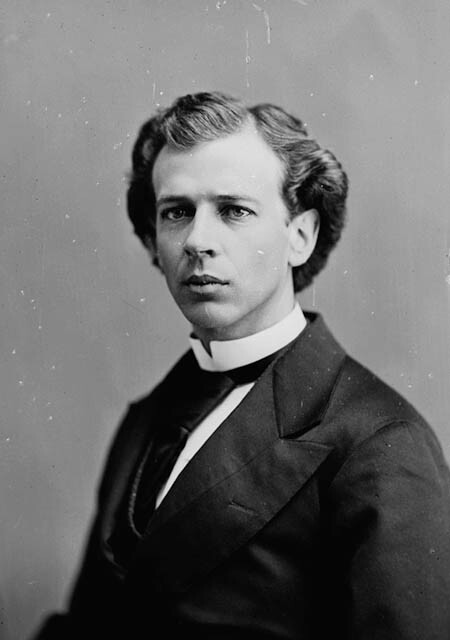 Only an extract from a speech delivered in some part of Ontario by the Honourable Member for Kingston [John A. Macdonald], in which the latter appears to have stated what I have just repeated, namely: that the delegates sent by Mr. Riel had not been received as the delegates of Mr. Riel, but as the delegates of the people of Red River. Once more, I say, this proof cannot convince me. For I have yet to learn that the delegates were informed of this distinction at the time of their reception; if such a distinction was made, it must have consisted of a mental restriction by which the Honourable Member for Kingston said to himself, while ostensibly receiving the dele­gates of Mr. Riel, that, in reality, he only wished to deal with the delegates of the Red River people. Whatever may be the case, if the Honourable Member for Kingston received the delegates of the people of Red River, his colleague, Sir George Cartier, received the delegates of Mr. Riel and they presented to him, as the representative of the Canadian Government, their letters of credit signed with Mr. Riel’s own hand. If this be the case, and it will probably be established by the evidence before the committee then the logical consequence of this act must follow and the amnesty be granted. I am in favour of the amnesty for still another reason – because all the acts with which Mr. Riel is charged are purely political acts. It was said here yesterday that the execution of Scott was a crime; granted, but it was a political act. The reason of this seems evident; Mr. Riel, in signing the warrant for Scott’s execution, did nothing but give effect to the sentence of a court. However illegal may have been that court, however iniquitous may have been the sentence rendered by that court, the fact alone that it was rendered by a court and that that court existed de facto was sufficient to impart an exclusively political character to the execution. It has also been said that Mr. Riel was only a rebel. How was it possible to use such language? What act of rebellion did he commit? Did he ever raise any other standard than the national flag? Did he ever proclaim any other authority than the sovereign authority of the Queen? No, never. His whole crime and the crime of his friends was that they wanted to be treated like British subjects and not to be bartered away like common cattle? If that be an act of rebellion, where is the one amongst us, who, if he had happened to have been with them, would not have been rebels as they were? Taken all in all, I would regard the events at Red River in 1869–70 as constitut­ing a glorious page in our history, if unfortunately they had not been stained with the blood of Thomas Scott. But such is the state of human nature and of all that is human: good and evil are con­stantly intermingled; the most glorious cause is not free from impu­rity and the vilest may have its noble side. Yes, once more, I say that to ask for the amnesty now will simply render it more difficult to obtain it eventually. Before sitting down, I may be allowed to sum up in a single word: we have no proof of the facts on which the motion of expul­sion rests and to adopt that motion would be not only to commit an arbitrary act, but to establish a precedent which will be a per­petual danger to our free institutions.